This is the story of a grand trip: Overland by train from Athens to Paris. We spent significant amounts of time in Greece, Bulgaria, Romania and France, made briefer visits to Hungary and the Czech Republic, and passed through Slovakia, Germany, and Belgium along the way. The occasion of the trip was a wedding anniversary for my parents and my dad's retirement. I was the logistics guy. The Transporter, if you will. The trip planning started after I stumbled across the web site run by The Man in Seat 61, a far more experienced European train traveler. He mentioned a trip between London and Athens, describing it mostly in terms of the major attractions of its end point, Athens, and leading from there into logistical details of three general routes. One route was by train to Italy, then an overnight ferry from the east coast of Italy — from Venice, Ancona, Bari or Brindisi — to Patrai, Greece, and then a short train hop along the northern coast of the Peloponnese to Athens. The second route was entirely by train through the former Yugoslavia by way of Belgrade and Skopje. The third choice takes you through more of the great capitals of central and eastern Europe — through Prague, Budapest, Bucharest, and Sofia. 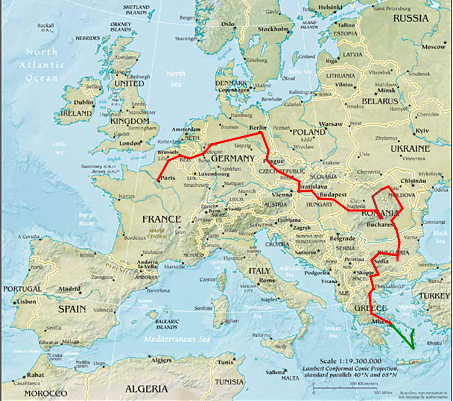 We decided on the third option, the northern and eastern route through Hungary, Romania, and Bulgaria. We were fortunate on the timing of the trip. In the spring of 2011, in reaction to their ever worsening economic situation, Greece halted rail traffic across its northern borders and cut itself off from Turkey, Bulgaria, and Albania, and from Europe in general. This makes absolutely no sense: a country whose economy is based largely on tourism cuts itself off from its sources of income. Well, more on that when we get to the relevant stages of the journey. As for an overview of the trip: They would fly into Athens and I would meet them at the airport, having been in Greece for close to a week and hopefully somewhat more useful by then with some very rudimentary Greek. We would fly on to the island of Mykonos and continue by ferry through the islands of Paros, Ios and Santorini before returning to Athens for a brief stay before starting the train journey. The first rail leg was a five-hour ride north from Athens to Thessaloniki, a full afternoon going north first through the mountains and then along the coast. After an overnight and a day in Thessaloniki, we took an overnight sleeper train to Sofia, Bulgaria. That was my parents' first experience with crossing a border by train in the middle of the night. In Sofia we saw some classic Bulgarian Orthodox cathedrals and an impressive level of prosperity and progress. It was another most-of-the-afternoon train journey from Sofia to Veliko Tarnovo, the old capital of the Bulgarian Empire and the heart of Bulgarian culture. It's well worth a longer stay, we stayed there for a few nights. From Veliko Tarnovo we had a short ride to Gorna Oryakhovitsa and waited there for what turned out to be the assembly of two international trains. We continued north across rich Bulgarian farmlands to cross the Danube and the Romanian border at Ruse, continuing to Bucharest, Romania. Another couple would join our group at Bucharest. They flew from the U.S. through Amsterdam to Bucharest and met us in Bucharest, where we all spent a couple of days. From Bucharest we took a major national train through Ploeşti to Suceava and then waited there for 90 minutes for a small local train to Gura Humorului. This is up in Bukovina in north-eastern Romania very near the Ukrainian border and almost as close to the Molvodian border (and, confusingly, this part of Romania is Moldova). The more I had seen about the area around Gura Humorului while planning, the more I thought it needed to be on the trip. We would pick up a rental car the next morning, spending three nights in Gura Humorului and the days exploring the area and seeing the monasteries and their painted churches. We then drove from Gura Humorului through the Carpathian Mountains to Sighişoara. This means that we did not cover the Ploeşti-Braşov section of track, although we far more than made up the distance while traveling from Bucharest to Gura Humorului. The first morning in Sighişoara, I drove to Braşov to drop off the car and returned by train. We explored Sighişoara for another day, and then it was back onto the rails with an overnight sleeper train from Sighişoara to Budapest, Hungary. A sleeper train leaves Bucharest at 17:45, bound for Budapest. We caught it as it stopped in Sighişoara just after midnight. We had just a short stay in Budapest. Then we took a train to Prague, Czech Republic for a similarly short visit. Both cities are worth more detailed visits. From Prague it was a series of two trains to Paris. First, an overnight sleeper train from Prague to Cologne, Germany, passing through Berlin in the middle of the night. This Czech train had the nicest overnight onboard accommodations I have ever seen. Then we connected after a short layover to a fast Belgian Thalys express through Brussels to Paris. After a day in Paris and a night in a hotel out in the suburbs, we picked up a rental car and drove out through Normandy. But those are stories for another page.